Digital technology, or ‘smart’ technology, has evolved rapidly in the past decade. It hasn’t just transformed how we communicate, work and learn, but also how we cook. The kitchen of 2018 is a playground for food lovers, with new and exciting tech appliances continuously hitting the market, making cooking easier, quicker and all-inclusive. When designing your kitchen, it is important to know that your chosen tech appliances are not only functional and of the highest quality, but also fit seamlessly with your kitchen, complementing the final design rather than competing with it. Here at Contour Kitchens, we’re proud to collaborate with some of the most prestigious appliance brands, including Gaggenau, Siemens, Neff and Bora. Dishwasher 400 series DF 481/480 – Gaggenau’s 400 series dishwasher disappears discreetly behind one of your kitchen furniture panels, which is handle-free thanks to the push-to-open function. Zeolite technology enhances drying and decreases the energy usage of the eight available programmes, presenting you with clean dishes and cutlery in under an hour. The wash time is even projected onto your floor. Vario wine climate cabinet 400 series RW 464/414 – This clever wine cabinet allows you to enjoy your preferred drink at the right temperature. With space for up to 98 bottles in two independently controlled climate zones, the electronic control system ensures constant temperatures of 5°C to 20°C - which can be set to the exact degree. The cabinet, available with glass doors or integrated panel doors, shields bottles from the vibration of the motor, whilst extendable beech and aluminium shelving protects wine from any errant aromas. The multiple temperature zones even allows you to store bottles at the same time as bringing other wines to drinking temperature. Vacuuming drawer 400 series DV 461 – This innovative product vacuum-seals gravy, sauces, herbs and cut fruit and vegetables into appetizing portions to stock up your fridge and freezer. Its chamber system is also tailor-made to vaccum-seal Sous-vide recipes to intensify flavours and maximise longevity. StudioLine – This is a range made up of the crème de la crème of Siemens household appliances, exclusive to kitchen studios and unavailable on the internet. Contour customers who choose StudioLine enjoy Siemens innovation in technology and design at the highest level, plus you have access to additional features that are exclusively available for StudioLine appliances. Home Connect App – This app allows you to manage your kitchen appliances from wherever you are through your tablet or phone. Connected Siemens appliances allow you to choose the best washing programme or look inside your fridge with just a touch of a button. Fully automatic bean-to-cup coffee centre – The ultimate indulgence for coffee lovers, this built-in coffee machine creates the perfect beverage and can also be controlled with the Home Connect App allowing you to be your own barista. Its coffeeSensor System grinds each variety of bean to the precise quantity and the sensoFlow System automatically alters the temperature of espresso shots to match their beverage, whist the singlePortion Cleaning and calc’nClean features cleanse the appliance after every use. 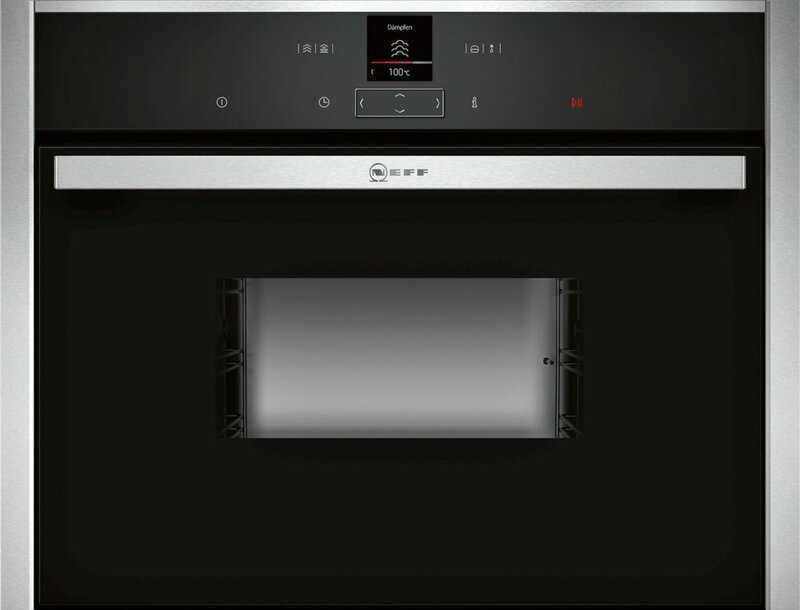 Compact Steam Ovens – Neff’s range of built-in FullSteam ovens combine all the heating modes of a full-featured oven with those of a steam oven, in one single appliance. Ideal for fish and vegetables, all you have to do is refill the concealed one-litre water container and your food will retain its nutrients and flavour. Bora Professional Revolution 2.0 – A winner of the 2017 Red Dot Awards, this new technology by Bora draws off odours and grease particles directly from your cookware. One of the major benefits of an induction hob with integrated extraction, is that it allows you to have much more freedom when designing your kitchen - hobs positioned in an island no longer need a canopy above to house extraction. It also allows you to cook without the worry of vapours rising up and spreading throughout the kitchen, whilst the trapping of grease particles in its stainless steel grease filter ensures you are always cooking in clean, fresh air.